A 5th grade girl asked a simple question. A frequent visitor to nursing homes (while her Mom works as a nurse practitioner), Ruby asked a resident why she was looking outside so intently. The woman paid a pet-sitter $12 to bring her dog of 12 years to visit; she watched as the dog left, not knowing when she’d see her beloved pet again. With tremendous empathy, Ruby saw that what brought this woman so much sadness had a simple answer. More, she started to wonder what other simple requests residents might have. So she simply asked: asked residents “if I could bring you 3 things in the whole world, what would those be?” CNN reports Ruby found that rather than asking for a new car or a million dollars, the requests were simple things: pants that fit, a phone, pet food, fresh fruit. With the help of her mom, they set up a Facebook page “Three Wishes for Ruby’s Residents” and a GoFundMe account, raising more than $93,000 for residents in five nursing homes in Arkansas. 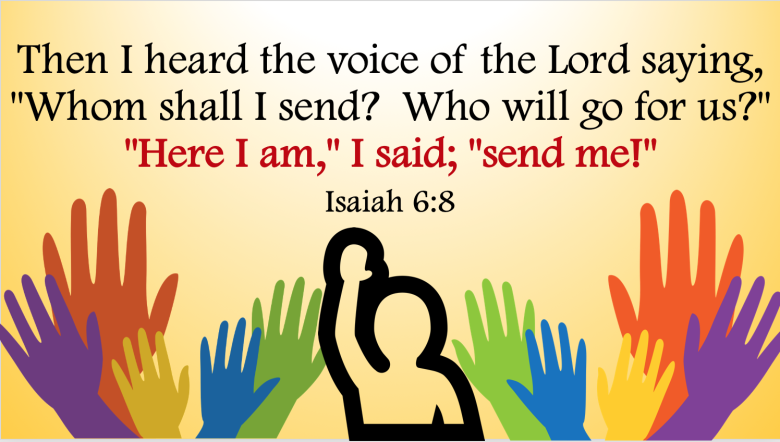 It’s so simple: See a need and respond with love. On the path of discipleship, this is what God asks of us: to love one another as we are loved (John 13:34). To see and respond to the needs of the least of our brothers and sisters (Matthew 25:40). 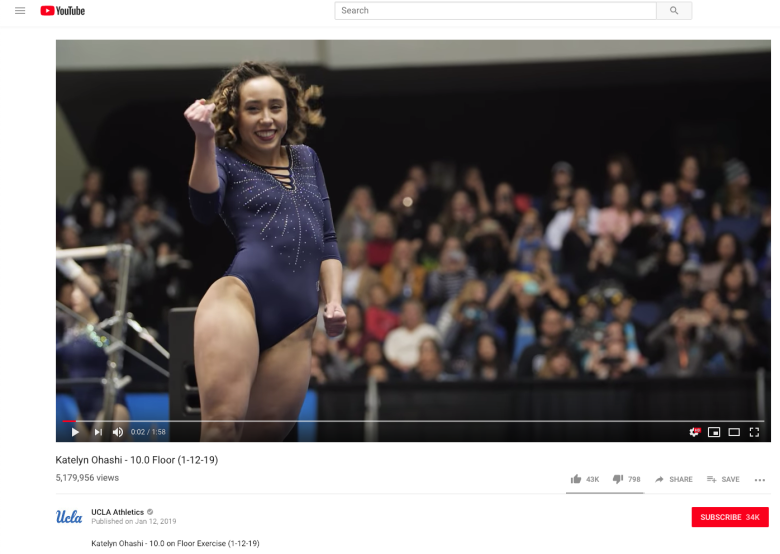 After the video of UCLA gymnast Katelyn Ohashi’s “perfect 10” floor routine went viral, NPR interviewed her head coach, Valerie Kondos Field about her character and skill. Katelyn had almost given up on the sport. “The elite level came at a price. Not just the injuries, but the body-shaming and the cut-throat competition that left her questioning her self-worth” (NPR’s Morning Edition). Caring more about a person’s humanity than about the role they play, regardless of the context, is the essence of respect for human dignity. Want to know how to live your faith in the secular workplace? Care about people more as human beings than as coworkers and employees. How does every single faculty and staff member live out the Catholic Identity of the school? Care about people more as human beings than as students and colleagues. Care for a person’s well-being more than the function they provide. Stop using people as objects. Stop objectifying the body for the sake of athletic or advertising success. Stop shaming. Stop the competition that leaves people questioning their self-worth. We don’t have to choose between people and profit, between personal well-being and excellence, between compassion and success. 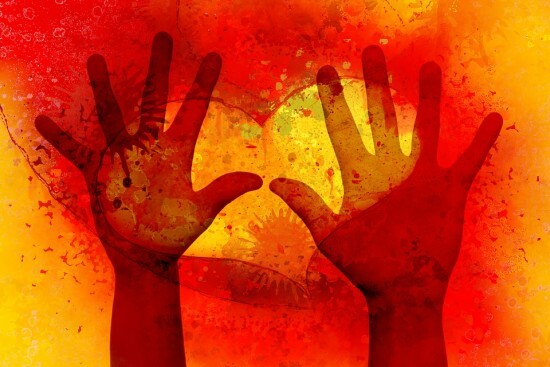 Be a catalyst: care about a person more as a human being than anything they can do. 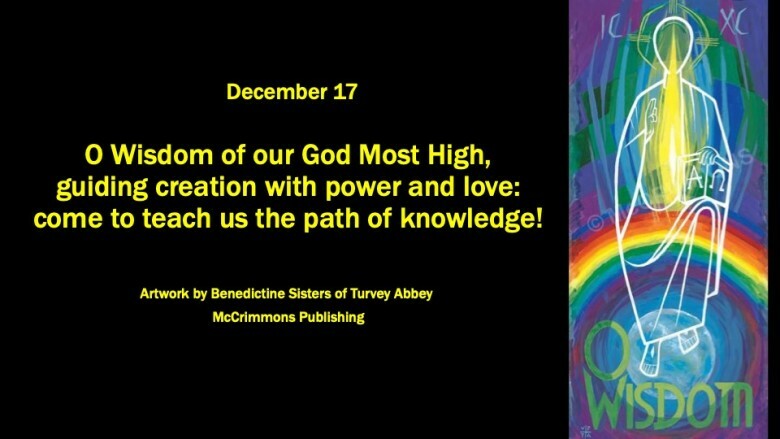 In case you missed, December 17 begins the O Antiphons, with O Wisdom. While working on a project for St. Mary’s Press, I came across artwork by the Benedictine Sisters of Turvey Abbey that captures the vibrant and joyful anticipation of Advent in the O Antiphons. These images and reflections from the Catholic Resource Education Center are so beautiful, I needed to share! The O Antiphons are seven brief sentences that highlight a title for the Messiah and a prophecy of Isaiah about the coming of the Messiah. 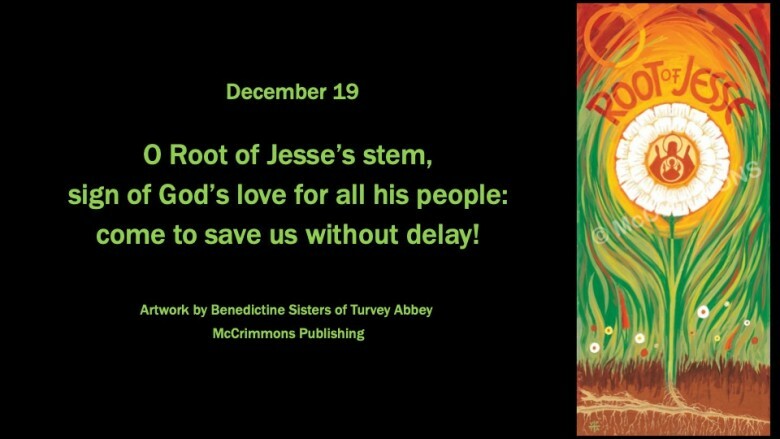 Part of the liturgical tradition since the very early Church, these beautiful theological statements are prayed in Vespers, or evening prayer, during the last days of Advent, from December 17-23. For more information about the artwork, visit the McCrimmons, a UK Publishing Company. While working on a project for St. Mary’s Press, I came across artwork by the Benedictine Sisters of Turvey Abbey that captures the vibrant and joyful anticipation of Advent in the O Antiphons. The O Antiphons are seven brief sentences that highlight a title for the Messiah and a prophecy of Isaiah about the coming of the Messiah. Part of the liturgical tradition since the very early Church, these beautiful theological statements are prayed in Vespers, or evening prayer, during the last days of Advent, from December 17-23. For more information about the artwork, visit the McCrimmons, a UK Publishing Company. Anyone who has seen me in the past few weeks knows that I recently taught an Adult Faith Formation class on the Book of Psalms. Why? Because I can’t stop talking about it. I have completely geeked out with research, reading, and passion for the Psalms. What I learned has had a profound impact on both my spirituality and my theological appreciation for the Psalms themselves. It’s changed the way I view suffering and how we pray about our struggles. Frankly, it’s changed the way I view most everything. I heard the suffering in Christina’s post: both her own struggle reliving painful memories, and her awareness that “many are still” suffering. …as the flood waters came into their home, Christina and her husband Anthony, their kids and pets were rescued by boat. Finally, Anthony was able to (briefly) return to the house. The devastation in our region was mind boggling. 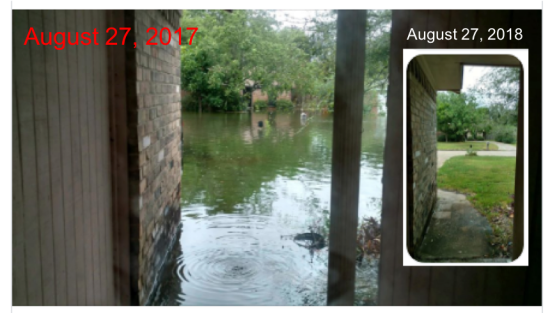 And so was the help Houstonians offered one another. Christina and Anthony received a small army of assistance as they began the arduous task of gutting the irreparable and cleaning the salvageable. Help from people they knew and others that “just showed up.” This happened everywhere around us. Our faith does not provide us with some sort of “suffering-protection-insurance,” but it does help us persevere by giving us plenty of models for calling out to God in the midst of suffering and an increased awareness of God’s grace in the midst of it all. This is especially present in the Psalms. 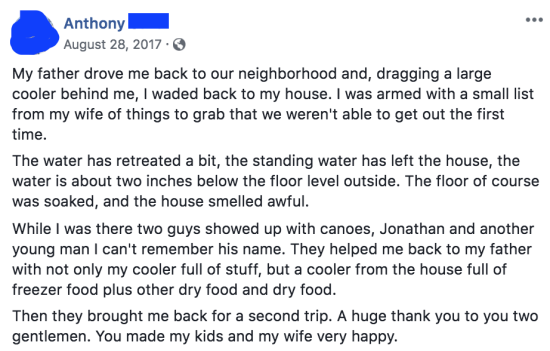 Anthony’s posts are akin to Psalms of Thanksgiving. They recall the suffering and express gratitude for gifts of God’s grace. Christina’s posts are steeped in Lament. But that’s not a bad thing. In fact, that level of honesty is necessary for an authentic relationship with God. The Psalms of Lament insist that we speak difficult truths to God in prayer, whether it’s simply acknowledging that these memories are painful or recognizing that many are still suffering. I have profound respect for Christina’s honest expression of what so many are still feeling, yet are afraid to say aloud. She is a compassionate woman whose faith sustained her through ten months of recovery, demolition, and rebuilding her home. She and her family have faced trial after trial after trial since the day the rains came. And she is lamenting: turning to God and speaking the truth. Over the course of the next few weeks, I hope to share some of my favorite insights about the Psalms with you. But rather than re-teaching the class (which I’d be happy to do! ), I plan to share a nugget at a time.